The Consultation on FIT rates for AD (and MicroCHP) was launched last May and the window for responses closed in July. The Department for Business, Energy and Industry Strategy (BEIS) eventually published their response last week, some seven months later. Despite the long wait, the response offered no significant diversion from the original proposals, most of which were greeted with somewhat mixed opinion. A total of 76 unique responses were received, with over 446 campaign responses being received regarding proposed payment restrictions based on feedstock for AD. This was clearly a controversial proposal, which has since been introduced in the RHI and it was therefore almost a given it would be translated across to the FITs for consistency and fairness. The upshot of the BEIS response is disappointing in the main, with only a short-term glimmer of hope for the industry with slightly higher than proposed tariffs across the small- (<250kWe) and medium-scale (250 – 500kWe) bands, and a tariff for the large-scale (>500kWe) band, which was omitted from the original proposals. Despite industry’s request for a micro-scale (<100kWe) band to be considered, this has not been introduced as BEIS have no evidence to prove significant differences in capital costs of plants <100kWe and up to 250kWe. There is a perception in Government that cost-reductions will transpire in the AD sector, giving a misconception that rapid tariff reductions will be accepted by the industry. The default degression mechanism remains in place, despite requests to remove this due to the current “queue” of projects awaiting pre- or full-accreditation. This will inevitably trigger the contingent degression in each period, resulting in us being back at current-day, unviable tariff levels within a matter of months rather than years. As AD is the only biomass-fuelled technology included in FITs it was questionable whether introducing sustainability criteria and feedstock restrictions, as proposed and applicable in other schemes (which also feature solid biomass combustion), would be a cost-effective action or whether it would become more of a burden than a benefit. However, the proposals have transpired and the new criteria and restrictions will come into force from 1st May 2017. The only significant concern here is an administrative one, with concerns raised about the burden and cost of evidencing compliance, but to this end, tools exist to assist plant operators, such as the NNFCC’s Biogas & Biomethane Carbon Calculator which is FIT-ready in anticipation of this occurring. If looking for positives, where a plant is also accredited under the RHI it will not also be required to report under the FIT scheme, so an element of pragmatism has been applied here at least. A summary of the new regulations is provided below, and full details are available in the BEIS publication which is available here. Sustainability criteria will be introduced in a similar way to already applies in parallel schemes, the Renewable Heat Incentive (RHI) and the Renewables Obligation (RO); applicable to all new installations from 01 May 2017. The minimum GHG threshold will be lower than applies in the RO currently; set for the FIT at 66.7gCO2eq/MJ, compared to 79.2gCO2eq/MJ in RO (although this is set to lower in 2020). Feedstock restrictions will be introduced, in the same way as are imminent in the RHI; payments for electricity not derived from the digestion of wastes and residues will be limited to 50% of the total biogas yield, on an annual basis. Plants that have applied for pre-accreditation before 01 May 2017 and successfully secure a quarterly cap will not be required to meet the sustainability criteria and feedstock restrictions. All wastes and residues should be considered carefully by operators to ensure that the waste hierarchy has been applied and alternative markets considered before conversion to electricity through anaerobic digestion. Where a plant is also accredited under the RHI, the operator will only need to comply with the RHI regulations on sustainability and feedstock restrictions. NNFCC provides policy and regulatory support to AD developers, operators, investors and suppliers, to help navigate this highly complex and somewhat confusing area. 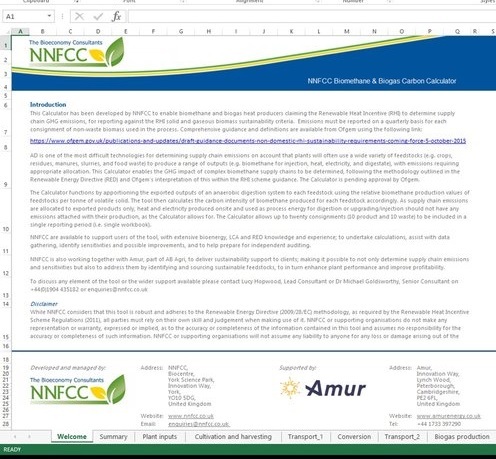 If you are unsure how these new rules will impact on your business, or wish to explore new business opportunities please get in touch with Lucy Hopwood, Lead Consultant for Bioenergy and AD on l.hopwood@nnfcc.co.uk or call +44(0)1904 435182. This article was written by Lucy Hopwood, Lead Consultant for NNFCC, and Bob Horton, Research Analyst for NNFCC.